In 1986 The Center for the Study of North Country Folklife, SUNY Canton, started by folklorist and faculty member Varick A. Chittenden is dissolved and Varick founds Traditional Arts in Upstate New York—TAUNY— to showcase the living traditions and folk culture of our region. Varick serves as Executive Director. The first Board of Directors include Dr. Laurie Rush (Clayton, NY) as president, Stanley Ransom (Plattsburgh, NY), Allan Newell (Hammond, NY), Judy Chittenden (Canton, NY), Vaughn Ward (Rexford, NY), and Peter van Lent (Canton, NY). Early TAUNY programs were based on results of surveys completed by The Center for the Study of North Country Folklife. One of the individuals identified in these surveys is Eli F. Tracy (Hermon, NY) a blacksmith and recipient of a North Country Heritage Award in 2008. In 1987 “Private Expressions/Shared Memories,” a one-man exhibition of the dioramas of Vietnam War experiences created by Marine veteran Michael Cousino of Gouverneur opens at the New York State Vietnam Memorial gallery in Albany. Several of Michael Cousino's dioramas become a part of TAUNY's permanent collection. In 1988 Bill Smith (Colton, NY) begins an apprenticeship with celebrated Adirondack storyteller Ham Ferry (Seveys Corners, NY) to study the repertoire and performance techniques of local traditional storytelling. This is the first of several apprenticeships with local master traditional artists sponsored by TAUNY. You can hear some of Bill Smith and Ham Ferry’s stories on the recording “From 20 Years of TAUNY Archives: Funny Men of the Adirondacks,” available for purchase in TAUNY’s North Country Folkstore. In 1989 an exhibit organized by Varick Chittenden opens at The Gibson Art Gallery at SUNY Potsdam called “North Country’s Grand Legacy: Folk Art from Five New York Counties.” It includes artists like quilter Genevieve Sutter (Tupper Lake, NY); Fred Morgan (Norwood,NY) whose famous tuba mailbox and mechanized dioramas of local scenes delighted visitors to his home; and decoy carver Bill Massey Waddington. In 1990 TAUNY is officially incorporated as a 501©(3) non-profit organization with a corporate board of directors. A one-man exhibit of Ogdensburg, NY folk painter Carl Martel’s memory paintings, “Logger Artist: Folk Paintings by Carl Martel,” is organized by TAUNY and exhibited at The Silas Wright House Museum in Canton, NY. In 1991 traditional music and dance programs are held at the Crary Mills Community Center with large crowds attending. Don Woodcock and Al Barney play for dancers, with the Julie Beaudoin Family from Vermont as special guests. In 1992 plans begin to develop for a major traveling exhibit of contemporary folk art from across New York State with Varick Chittenden as curator and folklorists from around the state as contributors. Among the the artists Varick documents is Veronica Terrillion of Indian Falls, NY who would later receive a North Country Heritage Award for her “Woman-made House and Garden.” Veronica spent years turning her three-acre property along Route 812 into a unique sculpture garden, full of figures (mostly concrete) created by this self-taught artist and inspired by her dedication to family, nature, and her devout Catholic beliefs. In 1993 Jill Breit joins TAUNY as the organization’s first employee (following Joan Barrick, Canton, who’d done clerical work for TAUNY) and works with Varick Chittenden to establish the first Salute to North Country Legends, which takes place on the campus of SUNY Canton.The first recipients of North Country Heritage Awards were Big Moose Community Church (Big Moose, NY), Alice Clemens (Osceola, NY), Ray Fadden - Tehanetorens (Onchiota, NY), Hamilton Ferry (Sevey’s Corners, NY), Bill Massey (Waddington, NY), and Veronica Terrillion (Indian River, NY). Also that year, TAUNY sponsors the first of several Elderhostels (week-long educational vacations for seniors) at the Edgewood Resort in Alexandria Bay. Sessions in later years are held in Sackets Harbor and Canton, each featuring courses about various aspects of life in the North Country. In 1994 TAUNY’s first public gallery opens at 13 West Street with two featured exhibits at the grand opening.“I Can Remember…Memories and Stories in North Country Folk Art” which includes works by eight North Country artists using a range of materials to reflect on their personal memories and experiences. The second exhibit, “That’s Just Our Way: Community Values in Old Order Amish Crafts,” highlights two Amish communities in St. Lawrence County and looks at their culture and values through the objects created for their own use and for sale to others. The North Country Folkstore also opens this year, selling unique items made by local artisans from the North Country. Broadway actress and longtime chair of the New York State Council on the Arts Kitty Carlisle Hart visits the TAUNY Gallery with other NYSCA members. In 1995 TAUNY’s exhibit “Out of the Ordinary: Community Tastes and Values in Contemporary Folk Art” opens at The Albany Institute as a part of an exhibition tour sponsored by The Gallery Association of New York State. This exhibit features folk artists from across the region and investigates their connections to their communities and cultures. The exhibit is organized into several categories including “Folk Groups, Old and New,” “Agents of Change in Contemporary Folk Art,” “Art for Community’s Sake,” and “Folk Artists and Their Worlds.” To present this exhibit to a wide North Country audience, TAUNY makes arrangements to take a busload of people from the North Country to the opening reception of this exhibit in Albany. TAUNY’s first annual Pea Soup & Johnnycake Lunch is also held this year during Canton’s Winterfest. This meal combines the traditional Quebecois split pea soup, often served in sugar shacks during maple season, with an early American favorite, cornmeal-based johnny cakes. This becomes a favorite annual event for many visitors. In 1996 “Take 5” traveling exhibits and related programs travel to more than two dozen venues in the North Country. They feature Mohawk crafts made to sell, Amish crafts for use in their communities, objects from St. Lawrence River fishing traditions, and Adirondack woodcrafts. The “Take 5” exhibits include “Adirondack Woodcrafts: Continuing Traditions,” curated by Varick Chittenden and “Along the Water’s Edge: St. Lawrence River Hunting and Fishing Arts,” curated by Dr. Laurie Rush and Dawn Rusho. In 1997 The TAUNY Board of Directors establishes the Evergreen Award to recognize exceptional interest in and support of traditional culture, arts, and artists in the North Country. 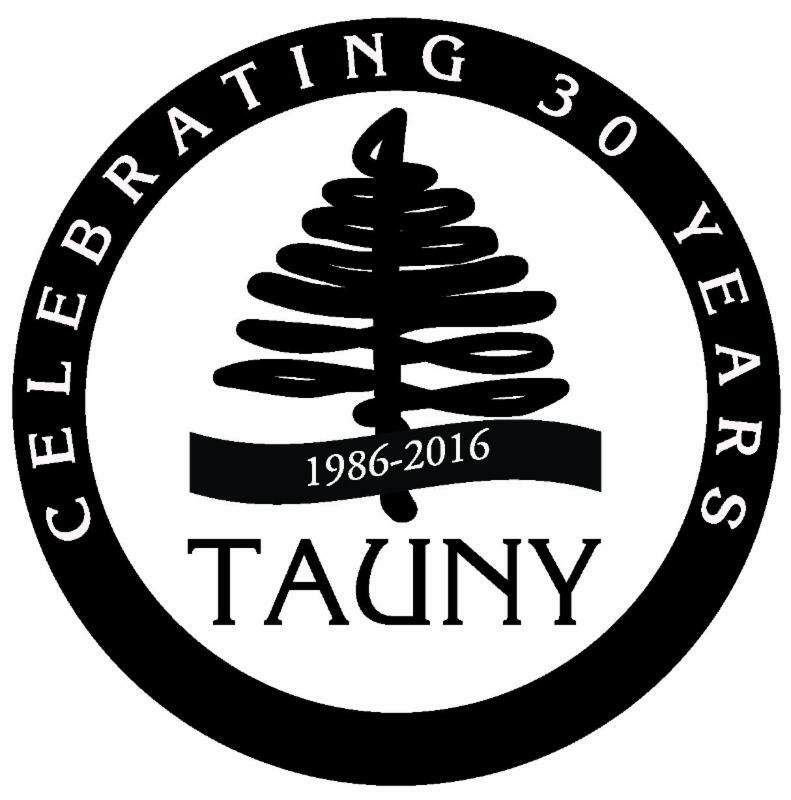 The name for this award is taken from TAUNY’s logo - a stylized fir tree from a 19th century stoneware jug made in the North Country, since the work of those being honored by the award also suggests the nurturing of old customs or traditions that could easily be abandoned or forgotten if those who have inherited them lose sight of their worth or usefulness. The first Evergreen Award recipient is The Niagara Mohawk Foundation. In 1998 as the organization continues to grow, TAUNY moves to a larger gallery space at 2 W Main Street on the island in Canton, NY. Also in 1998 a group of about 25 musicians played holiday tunes to a full house at the program “Merry Tuba Christmas” at Canton’s American Theater. This performance honors the gift of Fred Morgan’s celebrated tuba mailbox to the TAUNY collection. In 1999 spearheaded by TAUNY Board President Paul Fischer and his wife Joann Pfeil, TAUNY hosts the first Black Fly Fiddle Festival on the SUNY Canton campus. Jay Unger and Molly Mason perform in SUNY Potsdam’s Hosmer Hall as part of the festival. The festival attracts talented musicians from both sides of our northern border. After a few years the festival is renamed “The Borderland Fiddling Festival” in recognition of this exchange. In 2000 TAUNY receives the New York State Governor’s Arts Award, a prestigious recognition of cultural importance to the state. Kitty Carlisle Hart and Martha Stewart present the award at a gala event at The Metropolitan Museum of Art. At the end of 2000, TAUNY received word that its cookbook “Good Food Served Right” won first place in the national TABASCO Community Cookbook Competition, beating over 550 entries, including ones from New Orleans and Charleston. 2001 was a year of celebration around this award, including a series of food programs. The cookbook, which combines essays about local culture with recipes, was the result of years of food-based research completed by Lynn Ekfelt, folklorist and celebrated home cook, who researched communities across the North Country to find the recipes and stories that make up this comprehensive and entertaining compilation, available for sale in The North Country Folkstore. 2002 is a year full of accomplishments in TAUNY’s history. The same year TAUNY celebrates ten years of Salute to North Country Legends, it also starts a new, popular tradition - the Sugar & Spice Gingerbread Contest and Display, which quickly becomes an annual favorite. Also this year, a crew from Better Homes & Gardens comes to Canton to produce a story on “Good Food Served Right” and Edith Cutting donates her research from the 1940s on Champlain Valley folklore to the TAUNY archives. In 2003 TAUNY organizes and hosts “Common Places, Uncommon Stories,” the annual meeting of the New York Folklore Society in Sackets Harbor, NY. Visitors take a bus tour of TAUNY Register of Very Special Places (RVSP) sites including Crystal Restaurant (Watertown, NY), Burrville Cider Mill (Watertown, NY), E.M. Marilley, Co. Retail Store (Croghan, NY), Veronica Terrillion’s “Woman-Made House and Garden" (Indian River, NY), and Vivekananda Cottage in Thousand Island Park (Wellesley Island, NY). In 2004 TAUNY presents an exhibit of more than 80 carved song and game birds by the late self-taught artist Hazel Tyrrell (1894-1967) called “The Bird-woman of Pierrepont.” The exhibit features a sampling of carved replicas of birds native to the North Country carved during the last 22 years of Hazel’s life. Hazel Tyrrell was a master carver with a large following of fans and patrons from the North Country and far beyond. Also in 2004 TAUNY presents an exhibit organized by the Crandall Public Library in Glens Falls focusing on Adirondack woman called “Women of the Adirondacks.” This exhibit features a series of woodcut prints by artist Cheryl Mirer who interviewed a number of fascinating women across the North Country and used her prints to tell their stories. In 2005 Nick Spitzer, folklorist and producer of the nationally distributed American Routes public radio series, comes to the North Country to host an evening of traditional music by local performers presented by TAUNY at The Clayton Opera House (Clayton, NY).The program, “Northern Roots,” is a lively, memorable evening celebrating North Country music traditions. In 2006 TAUNY celebrates its 20th anniversary with a birthday bash at the Lazy River Playground in Hermon, NY, one of TAUNY’s Register of Very Special Places sites. More than 100 people attend the festive celebration that includes a pig roast, music, dancing, miniature golf, and roller skating. In 2007 TAUNY partners with the Adirondack Museum, the Town of Tupper Lake, and the Adirondack Watershed Alliance to launch the No-Octane Regatta at its new location on Little Wolf Lake. TAUNY organizes the land-based activities, which include boat building, paddle making and painting, and woodcarving demonstrations. Also in 2007 WPBS-TV of Watertown develops a series of programs on TAUNY’s Register of Very Special Places Sites. 2008 is a monumental year in TAUNY’s history. This year Jill Breit is named TAUNY’s new Executive Director as the organization continues to grow. Varick Chittenden becomes project director for a major capital campaign and creation of The TAUNY Center. TAUNY’s Board of Directors votes to purchase the former J.J. Newberry building at 53 Main Street in Canton, NY and TAUNY moves to this new space in June. Community support for an Early Bird Campaign underwrites the move and the first-year expenses of the purchase. In the fall of 2008 TAUNY presents an exhibit curated by Jill Breit, “Back to the Land: Hippie Houses and Homesteads for the 21st Century.” This exhibit tells a piece of the story of the back-to-the-land movement in the North Country through local architecture. Visitors from far and wide are delighted by the A-frame built by exhibit designer/installer Ray Whalen and installed in TAUNY’s gallery. In 2009 TAUNY celebrates the launch of “W is for the Woods” website of traditional Adirondack music with a weekend of activities including a music jam, a panel discussion of scholars and musicians, and a concert at the Edwards Opera House. This year TAUNY also officially launches the Evergreen Campaign with goal of $1.25 million to create The TAUNY Center. In 2010 after months of planning the new TAUNY Center, construction begins in October on Phase 1 of renovations for the exhibit galleries, reception area, informal sitting area, and North Country Folkstore space. Also in 2010 TAUNY produces “Home of Our Hearts: Fraser Family & Friends,” a musical CD by North Country Heritage Award recipients, and hosts a release concert at the Edwards Opera House. This cd is available for purchase in The North Country Folkstore. In 2011 TAUNY celebrates its 25th anniversary. In June a new exhibit titled, “TAUNY at 25: A Retrospective Display,” opens at The TAUNY Center, taking visitors on a journey through TAUNY’s history. The exhibit includes a variety of art and objects from past exhibits, photos and information from programs and displays, and brochures and other printed materials from the past 25 years. This year also marks the completion of Phase 1 of The TAUNY Center renovations. This phase of construction includes installation of an elevator to make all three levels of the building accessible. On Saturday, September 17th the newly renovated TAUNY Center officially opens and the grand opening celebration includes about 100 of TAUNY’s generous donors. In 2012, after a successful fundraising effort raising $1.126 million for acquisition and renovations through the Evergreen Campaign, The TAUNY Center moves on to Phase 2 of construction. Phase 2 includes renovations to the basement, transforming large sections into an archives storage room and a recording/listening booth. Also in 2012 a new exhibit opens called, “The Amish, Our North Country Neighbors,” curated by Dr. Karen Johnson-Weiner, Professor of Anthropology at SUNY Potsdam. This exhibit explores mainstream society's relationship to the Amish, Amish history, Amish communities role in society, and Amish settlement patterns in New York State. In 2013 TAUNY spearheads a major regional collaboration called “Songs to Keep” to draw public attention to the folk song collection assembled by Adirondack song collector Marjorie Lansing Porter. This ground-breaking project showcases and raises awareness of the folk music of New York’s Adirondack North Country. Outcomes of the collaboration include an album and concert tour, a song book, a traveling exhibit, and an award-winning documentary, “Songs to Keep: Treasures of an Adirondack Folk Collector.” Partner organizations for this project include Mountain Lake PBS, the Adirondack History Center Museum, and SUNY Plattsburgh Feinberg Library's Special Collections. The “Songs to Keep” cd, dvd, and songbook are for sale in The North Country Folkstore. In 2014 TAUNY presents an exhibit and a variety of programs that focus on the changing work on family dairy farms in the North Country. This exhibit and research project is funded by the Archie Green Research Fellowship from The Library of Congress, which TAUNY was awarded in 2012. The exhibit is titled, “Every Single Day: Life on North Country Dairy Farms,” and features photographs from 15 farms taken by internationally renowned photographer Martha Cooper and excerpts from interviews with more than 20 farmers and employees. This year TAUNY also works with partners in the region on a project to determine how non-profits could better serve arts entrepreneurs. As a result, TAUNY increases the organization’s commitment to marketing the work of regional artists and small producers. TAUNY expands the product line in The North Country Folkstore, establishes the Annual Holiday Showcase to feature more work by local artists and craftspeople, and starts presenting a rotating Featured Folkstore Artist series. In 2015 construction begins on The TAUNY Center’s new demonstration kitchen. The addition of this kitchen launches an important, new chapter of food-centered programming focused on traditional food from the region. TAUNY celebrates the opening of the new kitchen with the return of the annual Pea Soup and Johnnycake lunch, a TAUNY tradition.